The Command Center of the Future is a prototype project underway at the Space and Naval Warfare (SPAWAR) Systems Center Pacific. The CCoF as shown above is a mock-up of the actual technologies that will be used. 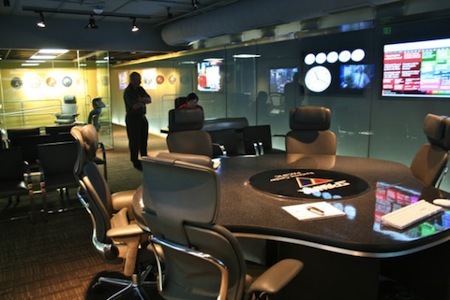 It showcases technology like multitouch computer access screens, advanced telecommunications, and a glass enclosure that automatically darkens to create privacy and security. The intent is to give decision makers a private and secure place to have classified discussions. ...the state-of-the-art in command center workflow theory is built around the idea of flow. [SPAWAR research engineer Jeff Clarkson] explained that research has shown that decision makers think better if they can move around while they talk and that's why the CCoF here has been designed to allow such senior officials to walk and talk and never lose sight of those they're communicating with. In the past, by comparison, the experience has been much more sedentary, with officials coming in and sitting down at a table the entire time. Science fiction writers have been imagining what military decision-makers might use as a command center since before WWII. 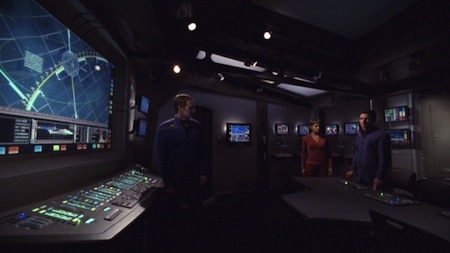 More recently, take a look at this scene from the Enterprise from Star Trek: Enterprise. 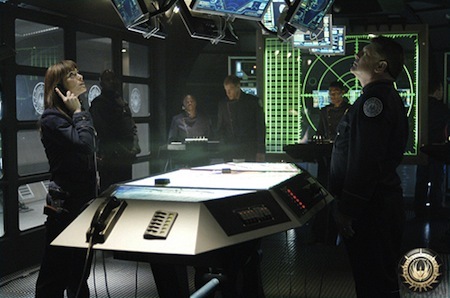 Here's another command center of the future - this one from the newly re-imagined version of Battlestar Galactica. It includes a variety of displays, showing ship's status, star charts, sensor data and access to computer data.